You might have been enjoying the perks of working from home too much that you’re forgetting the life ‘out there’. You’re too focused on your projects that you have a strong tendency to dismiss taking breaks and having face-to-face interactions with other people. You’re too digitally connected with your remote team but you’re falling short in nurturing actual connections with your family and friends. Working from home every single day makes you more inclined to becoming a loner; a hard-working individual who gradually drifts away from social circles. There’s nothing really wrong with indulging in your alone time. Besides, it’s in the nature of freelancing–to do things on your own. The only downside is that too much of this isolation can leave you lonely. Worse, it makes you more prone to developing social anxiety–the fear of interaction with other people. People with social anxiety feel uncomfortable when stuck in a crowd. They’re afraid of being judged when they attempt to open a conversation. They struggle when trapped in a situation that requires them to socialize. 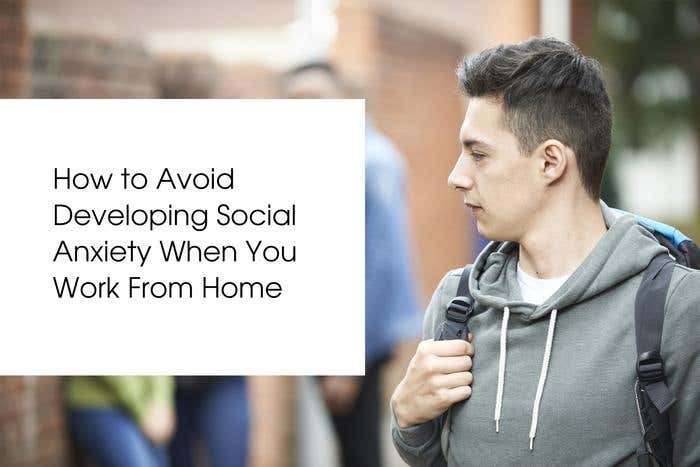 If working from home is slowly affecting your social skills, the only way to stop this from worsening is to go out more often and reconnect with people. How can you avoid developing social anxiety? Freelancing solitude is real. So before it brings you any serious problem, find other freelancers who can help you deal with what you’re going through. It helps to know that, in this case, you were never really alone all this time. Meet ups provide you a great chance to network, too. There could be some attendees who need help in your area of expertise. Take every chance of collaboration. It will boost not just your social skills but also your career (think: collab projects). Since you’re in full control of your time, you can set an hour a day to do something far different from the work that you do. It could be an activity you’ve tried before or anything you have zero knowledge of. Because the whole point of this is for you to socialize more often, find workshops in your community so you can learn with a group. Do you need to go to the market or take your cat to the vet? Schedule it on a weekday even if you have work to do so you have a reason to get away from your desk and take a break. Go out for lunch once a week. Just because you work from home it doesn’t mean you can’t have a lunch out. Invite a friend or a family member because eating alone outside will defeat your socialization goal. If you’re missing the social interaction in your old workplace, set a day out of your home office and rent a desk at a communal workspace. This shared environment gathers like-minded people, mostly creatives and soloprenuers. Be ready as you might get the chance to find a potential business partner or client in the future.